After attending SPAB’s 2015 autumn lectures on curious things found in old buildings, Kelly Appleton-Swaine, building conservation officer, Heritage Lincolnshire, was inspired to find out more about the Old Kings Head, Kirton, a former coaching inn with a story to tell. This story first appeared in the SPAB Magazine, a benefit of SPAB membership. The darkness of a cold, wintery night can set the mind imagining all sorts of horrors. Our senses are heightened and small sounds seem large and frightening. The noises of nocturnal animals -scratching, sniffing, scurrying – mutate, conjuring monsters, witches and evil spirits. In the absence of light, the creaks, cracks and groans of the building around us moving and settling after the heat of the day sound more like someone (or something) knocking, tapping or scraping at the doors and windows trying to get in. Terrifying! Then we flick the light switch and after blinking in the sudden brightness, everything returns to normal again. It’s only the cat prowling outside, sizzling sap from the cooling fire, a twig tapping against the window. It is no wonder that our 17th century counterparts were so superstitious when the fear of witches, evil spirits, spells and curses was very real. Warding off the supernatural was a powerful motive for actions which seem to us, in our light-filled, busy modern day world, decidedly odd and strange. After attending the 2015 SPAB Autumn Lectures I understood this a little more, although some aspects did still seem baffling. I could understand why ritual and sacred marks were carved into windows, doors and fireplaces, but the reasons for hiding dead cats, shoes and skulls in walls or under floorboards still took an extra leap of the imagination. It was, however, fascinating and was made more so by Brian Hoggard whose lecture, ‘Shoes in the chimney, cats in the floor’ left me intrigued and wanting to know more. Afterwards as I stepped out into the busy October semi-darkness, I wanted nothing more than to race back to Lincolnshire, find a torch and start scouring Heritage Lincolnshire’s new building conservation project, The Old King’s Head, for signs of marks or buried felines. Luckily I didn’t have too long to wait until something curious turned up. Heritage Lincolnshire is a Building Preservation Trust that works across the county to help protect, preserve and celebrate Lincolnshire’s rich heritage. Purchased in early 2016, the Old King’s Head is a brick built former coaching inn, located in Kirton, on what was the main London road into Boston. After decades of neglect, the Grade II – Listed building has become at risk and in danger of being lost. The Old Kings Head was built in two main phases. The first was completed in 1599 and the second phase, in 1661, consisted of major remodelling. This second phase, as noted by Pevsner, is in the Fen Artisan Mannerist style, an architectural term coined by Sir John Summerson in the 1950s to describe a style of building which was designed and built by craftsmen rather than architects. There are several examples in the Fenland area such as Church House in Boston and Aslackby Hall near Bourne. The building has a long and fascinating history as a coaching inn and was mentioned in the autobiography ‘The Life of John Rastrick’ (1650-1727). As a Lincolnshire non-conformist clergyman. Rastrick used his money to release fellow non-conformists and refused to baptise the local children if he felt their parents were ‘loose and scandalous’ people. This made him extremely unpopular with the Kirton locals who, by his own admission, all hated him and felt he was ‘too rigorous and cruell [sic] to make the Children suffer for the Parents faults’. This led to a near fatal incident in 1678 when Rastrick was locked in the dining room of the King’s Head with a Mr William Hunt (Rastrick would not give him communion due to Mr Hunt refusing to repent his ‘former ill life’) who flew into a rage shouting ‘We’ll die together in this room!’ Rastrick only survived due to a neighbour intervening. There were several other lively characters associated with the King’s Head, which remained as a pub until the late 1960’s when it was converted to residential use. Since purchasing the building, the Trust has been spending time investigating its construction and development and we are benefitting from expert advice on the historic timbers, thatch, paint and mortar. Due to the age of the building we suspected we might find marks or items of apotropaic interest and I attended the SPAB lectures to ensure that we would know what to look out for. We have also been talking to the local community, including previous occupants, and it was at a meeting with a former resident that I first heard of the bottles in the roof. Up to this point we had not fully investigated the roof space apart from shining a torch into its gloomy depths. We knew that the pub had once been thatched and that a pantile roof had been built over the top of it. From what the torch illuminated, some if not all of the original thatch base survives. On hearing about the bottles we investigated further and found three broken glass bottles covered in dust and cobwebs hanging from a roof beam. Our source told us that his grandmother ordered him and his siblings never to touch them but they were never told the reason why. We decided to ask Brian Hoggard to visit to see if there was an explanation. Brian’s visit was enlightening and extremely interesting, and although we still don’t really know why the bottles were put there a few theories have been put forward. When we first saw the bottles the idea of them being ‘witch bottles’ was mooted. Witch bottles are normally buried; they contain items such as pins, nails and urine and are complete (upon burial). Our bottles are hanging, broken and it is believed that they date from between 1800 and 1850. One theory is that they were used as part of a game when coach men and stable boys would sleep in the roof space and throw stones at hanging bottles, scoring points whenever one was smashed. However the rope that the bottles are hung with appears to be the same age as the bottles and the way it is knotted shows they could only have been hung after they were broken. If they are not witch bottles or the remnants of a game, what are they? The last and slightly speculative (or romantic) theory is that the bottles represent people who lived in the inn. Looking into historic records we found that a John and Elizabeth Pulford lived at the King’s Head in the mid 1800’s. They married in 1835 and had their first child, William, the following year. Sadly there is record of William’s burial aged 2 in July 1837 and later in the year Elizabeth was buried too, along with another child – Richard Pulford – who was only 25 weeks and three days old. Could it be that in his grief John Pulford had hung the bottles in the roof as representations of Elizabeth, William and Richard? Choosing broken bottles because they had been tragically taken away from him? It is quite likely that we will never know, but the mystery is intriguing and it brings the building and former inhabitants to life. Heritage Lincolnshire is only at the beginning of our journey exploring and renovating the Old King’s Head. Our hope is to return it back into a thriving centre of the community. There is still a lot to discover so who knows what other mysteries we will find on the way? If you would like to make a donation to the conservation of this historic building and/or to the work of Heritage Lincolnshire, you can do so online. 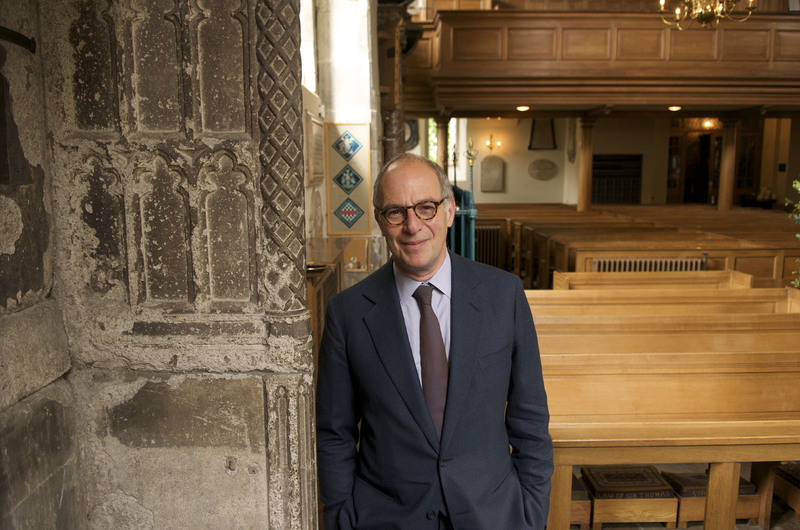 As Loyd Grossman comes to end of his time as Chairman of the Churches Conservation Trust, he talks to SPAB communications manager Kate Griffin. Loyd Grossman is a pleasingly difficult man to pigeon hole. His diverse enthusiasms and commitments could almost be seen as the accomplishments of someone from earlier age when a person could be defined by their interests rather than their profession. Loyd’s distinctive swooping vowels made him instantly familiar as a broadcaster when he fronted several hugely popular television series in the 1980s and 90s, but it is perhaps another small screen appearance that gives the clue to his range and depth. In 2009, he won an edition of BBC’s Celebrity Mastermind and his specialist subject was 18th century art and artists, something that viewers of Through the Keyhole or MasterChef, might not have expected. Then again, they might also have found it surprising that Loyd has an ongoing parallel ‘career’ as a rock musician. In 1977 his punk band Jet Bronx and The Forbidden reached number 49 in the UK singles chart with “Ain’t Doin’ Nothing” and he returned to performing music in 2008 with a new version of the group. The son of a Massachusetts art and antiques dealer, Loyd graduated from Boston University with a degree in history before arriving in the UK in the 1970s to study for a master’s in economic history. He subsequently read art history at Cambridge where he received his PhD. In addition to his television work, a lifelong interest in history and the arts has led to his involvement with a number of heritage organisations. In 2007, he was appointed Chairman of The Churches Conservation Trust (CCT) and in 2009 he was appointed Chairman of The Heritage Alliance, the UK membership organisation that represents more than 100 leading non-governmental organisations across the heritage sector. You’ve enjoyed a very varied career, how would you describe yourself? I try very hard not to describe myself. I’m very fortunate in that I try to pursue the things I’m interested in with a great deal of commitment, passion and love. It may be heritage, it may be higher education, and it may be playing the guitar. I am a great enthusiast and an optimist. I always believe that things can be made better if we try. I don’t have a career, I have an attitude. You are clearly an anglophile, how did your enthusiasm for Britain and its heritage begin? I love this country. I came to London in 1974 to do a post graduate degree at the London School of Economics. And I’m still here. My academic discipline has always been history. I grew up in Marblehead, a famously beautiful part of New England with a very strong sense of history. From childhood, thanks to my parents and my environment, I was always interested in history, and architectural and art history. Really, I think it was inevitable – for someone like me who grew up in New England and who was interested in history – that Britain would have an appeal. For Americans, the Revolution of 1776 is an extraordinarily evocative and romantic thing – it’s the moment at which American history and British history seem to be on a threshold. You can’t understand one without understanding the other. Why is the past relevant? I think it sets us in the context of all those who’ve come before and makes us think about the future. I’m very clear that it’s not just about us and it’s not just about us feeling good, productive or aesthetically satisfied. It’s about us as inheritors of this incredible history and wanting to pass it on to future generations – wanting our children and grandchildren and so on, to grow up in a beautiful, inspiring, historically rich and meaningful environment. How did you become involved with the Churches Conservation Trust? In 2007 I’d finished six wonderful years as a commissioner for English Heritage and I knew I wanted to stay in the heritage field. Everything is a matter of timing. Miraculously, the Chairmanship of the CCT was available. I had met, and greatly admired, the two previous Chairs – namely Liz Forgan and Frank Field – so I knew what a great organisation it was. I thought, what the heck, I should try for it. I must add I never expected to get it. In those days ‘celebrity’ wasn’t in any way a necessary part of the criteria for the chairmanship. Oddly enough, at that stage I don’t think the fact that I was in some way well known played a part in the process. You are stepping down from the role of Chairman of the Churches Conservation Trust in 2016, looking back what do you consider to be the most satisfying achievements during that time? It’s been nine years and it’s been amazing experience – a really incredible part of my life. I’ve worked with so many interesting people who share a real passion. It’s an organisation that punches way above its weight because we all love the mission. I’m pleased that during my time as Chairman the size of the charity has increased by more than threefold, which means we are doing and are able to do more and more and more wonderful stuff. Of course, there’s still a huge amount to tackle, but I think, modestly, I’ve helped to play a part in creating a framework or platform to enable it to go on doing and achieving great things in the future. There are thousands of ancient churches across the UK. With diminishing congregations and huge care challenges, what does the future hold? Nationally, I believe there are around 16,000 listed churches. The CCT is a smallish charity and we only look after 350 of them, which, actually, still puts us in the same category in terms of the number of properties in our care as, say, English Heritage or the National Trust. It’s a huge challenge, but I am full of optimism. I hope that the CCT leads by example. I think we have created very innovative models which show the extraordinary and imaginative things you can do with listed churches, while remaining consistent with their consecrated status. We try very hard to exercise a pastoral role and we’ve shown that one can be creative and full of hope and full of commitment to do the best things for the communities that surround our churches. Of course, it’s not a uniquely British challenge. We’ve exported our model to other countries. We’ve taken a leadership role in something called Future Religious Heritage Europe which is trying to help others deal with the similar issues facing their own historic buildings. What will never change – and this is true for everyone in the heritage world – is that our aspirations, which are so great and so beneficial, will always outstrip our resources, but nonetheless we will keep moving forward and keep improving things. The challenges and difficulties are great, but so are the opportunities. Do we believe that historic buildings have the ability to inspire people and make them more creative, more entrepreneurial and more complete? The answer to all those questions for me – for all of us – has to be ‘yes’. We are all nuts to be doing this, but we believe it will help people now and in the future, and we will keep on doing it. We will triumph. Is it about people or buildings? It’s about people. It has to be. It’s about saving buildings to help people have better, more interesting, more fulfilled lives. The full interview was published in the summer 2016 SPAB Magazine. The magazine is just one of the benefits of SPAB membership. Dr Brian Hoggard is an expert in the archaeology of British folk magic. This feature on the witch bottles of England first appeared in the spring 2016 edition of the SPAB Magazine. The magazine is benefit of SPAB membership, for details on becoming a member please see our website. Witch-bottles first appear in the archaeological record in England in the first half of the 17th century. They were initially used as a specific counter-spell to undo harmful bewitching. For the first 100 years or so of their use a type of stoneware bottle colloquially known as a ‘bellarmine’ was used, glass bottles were used later on. Witch-bottles, like other apotropaic (evil-averting) objects, were deliberately concealed so it is only when buildings are demolished, repaired, or when archaeologists excavate building sites that they come to light. This means that only very few get reported to a local heritage service. The amount that can be found is also limited by how many buildings survive from any given period. Blagrave is prescribing a method of turning the witches power back upon them using the sympathetic link between the witch and victim. It seems that the idea was that the bottle represented the witch’s bladder and, by inserting pins and the victim’s urine into the bottle and then heating it, this would cause intense pain to the witch, forcing them to lift whatever spell they had cast. When the contents of witch-bottles are examined they almost always contain evidence of iron in the form of pins or nails. The next most common ingredient is hair with some bottles yielding large locks of it. Almost all of the bottles which have been tested for urine have tested positive. Sometimes a small piece of fabric in the shape of a heart is found and pretty much anything prickly or unpleasant could be included. The early texts do not mention hair at all and they also do not mention deliberately bending the pins or nails before inserting them into the bottle – another difference from the texts. The accounts only refer to burying the bottles if the heating was unsuccessful. All of the examples in my records were buried or concealed which suggests that the process of heating the bottles did not work well and that burying bottles was widespread and well known. It is my contention that this actually became the normal way to treat a witch-bottle. A bottle found beneath a parish boundary wall in Dorset. After analyses it was found to contain beef tallow and spring water, presumably this was a witch bottle to protect livestock. Mapping early witch-bottles shows a distinct bias towards the south east of England and parts of the south coast. These bottles were imported in vast quantities full of beer and wine but the stoneware was so durable that they were reused many times, including as witch-bottles. Thus far I have not seen any examples of bellarmine witch-bottles further north than Leeds, yet the trade in stoneware vessels did reach this far. As we move beyond the 17th century glass witch-bottles in the shape of small phials, bottles and occasionally jars begin to be found in all parts of Britain. There are several examples from the USA and a few from Australia too. Within the home slightly more than half were found either beneath the hearth stone or within the construct of an inglenook fireplace. The next most common location was beneath the floor and then beneath the threshold. From the middle of the 18th century onwards the locations and contents begin to diverge away from the original recipe and locations and there is increasing use of glass bottles. In the grave of a young adult at All Saints Church, Loughton, Buckinghamshire a late 17th or early 18th century glass steeple bottle was discovered lying between the left humerous and upper chest. The bottle contained several copper pins and a number of pins were also stuck into the cork. The bottle contains liquid which may be urine, although no analysis has yet taken place on this substance. Based on currently available records for witch-bottles it seems that this is the only case of one being discovered in a coffin although several other bottles have been found buried in churchyards. Presumably the bottle was placed in the coffin as a kind of counter-witchcraft to perhaps help protect the body and soul in death or to exact revenge on the perpetrator of the witchcraft which was thought to have led to his death. In Pershore, Worcestershire two small glass phials were discovered along with three childrens shoes and a collection of toys. The group was discovered behind the hearth. In this instance the group of objects were dated to the mid-19th century. The phials contained wheat husks and possibly some resin from a pine tree. This is possibly residue connected with the production of pine beer which was once commonplace. The idea with this collection of objects appears to have been to bring together the shoes, two small bottles and toys to serve as a decoy for any bad influences that might want to attack the home via the chimney. Initially it seems that witch-bottles were a specific counter-spell designed to cause physical pain to the witch thereby giving the opportunity to barter for your own unbewitching. I already noted that, if the heating was not successful then the bottle would be buried which would lead to a slow death of the witch. Over 50% of witch-bottles are found by the hearth which suggests that the heat and also the location by the only portal which was permanently open to the sky was important. The amount of effort involved in creating a witch-bottle and then digging a large hole for it is quite significant and it’s my contention that as time went by the way people thought of witch-bottles changed to more of a spirit trap. The idea being that negative energies entering the home via the chimney would be sniffing out the victim and locate them conveniently near the hearth (the hair and urine) and plunge into the bottle become impaled on the ghostly pins and nails which had been ritually killed (by being deliberately bent). The more I explore the beliefs, practices and customs of the past the more certain I am that life was viewed through a complex web of beliefs regarding magic, folklore, the supernatural and religious forces. Unseen forces surrounded and permeated everything. Witch-bottles serve as a small window into that world. For more information on apotropaic objects visit Brian Hoggard’s website.